DRUM ROLL PLEASE!!!! 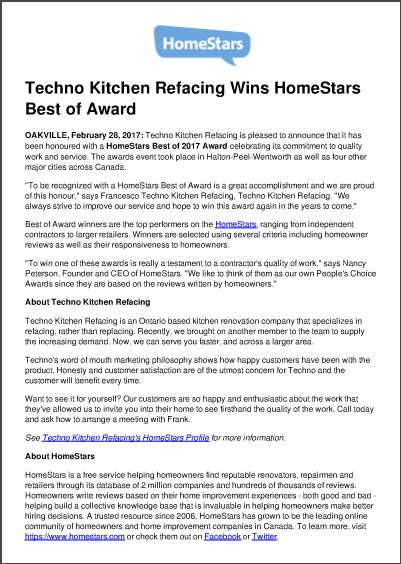 Techno Kitchen Refacing is pleased to announce that it has been honoured with a HomeStars Best of 2017 Award celebrating its commitment to quality work and service. Thank you to all our customers; it is truly an honour to serve you and make you happy. Thank you to all our staff for their hard work and for always giving their all. We look forward to continue serving you for many years to come. We are committed to provide the best service to our customers plus offer high quality products.